Fair play to Amber Rudd for seemingly acting quickly to rectify this today but you have to ask serious questions of a department that can f*ck up quite this spectacularly. Particularly damning words from Rudd towards her own department, which just so happened to be run by Theresa May prior to that. Anyone know what happened to her? She went on to lead the con party ! What has happened is an absolute disgrace. I’m not sure it is necessarily political but once the Tories became aware they should have reacted quicker. We really are turning in to a pretty unpleasant nation. I quite agree. It's embarrassing and sickening. You have to wonder what must be going through these people's heads in the Home Office when they are dealing with people who have clearly been legally in the UK and contributing to society for over 50 years in some cases. Jobsworths conditioned by callous and pig-headed policies from on high. May should come out and apologise to those affected ASAP. Small details of official callousness are particularly upsetting. Judy Griffith, 63, who came from Barbados in 1963 when she was nine, had been trying to sort out her status for years, and queued for five hours in a Home Office processing centre on 27 December, to be told that, although officials believed her claim was valid, she was “not on the system”. She received a letter in January stating that new checks needed to be made, adding: “Please note it is no longer possible to make an enquiry in person. Please telephone the number on this letter in the first instance if you need to contact us.” There was no telephone number on the letter.
? This is a decades old oversight. We are turning into a more hyperbolic nation similar to the US. Where touchy feely virtue signalling matters more than reasoned analysis. You have to wonder what must be going through these people's heads in the Home Office when they are dealing with people who have clearly been legally in the UK and contributing to society for over 50 years in some cases. Small details of official callousness are particularly upsetting. Judy Griffith, 63, who came from Barbados in 1963 when she was nine, had been trying to sort out her status for years, and queued for five hours in a Home Office processing centre on 27 December, to be told that, although officials believed her claim was valid, she was “not on the system”. Whilst it should never have happened and it's good that she has put a stop on this, while providing cost free help to rectify it, would an ID card system not have resolved it? They always seem to be rejected on the basis that they'll be unfair to people who shouldn't actually be here. The PM has also apologised now too. At least it didn't stop David Lammy from letting facts get in the way of his indignation. 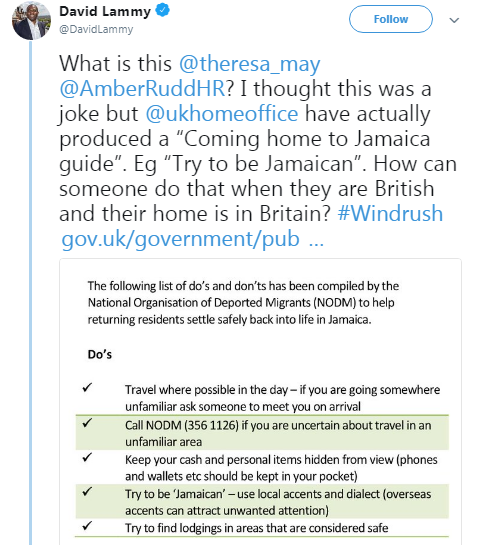 That "guide" was produced by Jamaica, not by the Home Office. With Windrush,cannot imagine how under developed and quiet Croydon would be. Who on earth would be helping to run our public services if it were not for Windrush?? Are you trying to say that Croydon is better now than in 1958 or '68 or '78? You have to be joking.